Most students with Nonverbal Learning Disabilities (NLD) are bright. They often do well in school, especially on tasks involving facts and logic. However, many of these students experience learning challenges, frequently in language skills. Difficulty with higher-level language skills such as figurative, ambiguous, and inferential language. Figurative and inferential language may negatively impact reading comprehension when ideas are not stated directly and themes must be inferred. Poetry and fiction can be particularly challenging. Problems with social understanding can play a role in reading comprehension. It’s assumed that students will be able to infer the feelings and goals of characters in fiction; that’s not likely if this is a challenge in daily social interactions. Because NLD students are detail oriented, they may get lost in details and have difficulty organizing and prioritizing ideas. Even extremely brilliant and articulate students can have trouble “getting to the point” of what they’re saying. They may circle an idea with details and have trouble getting to its essence. Many students experience challenges in writing, since writing involves the same skills. I’ve found NLD students who are articulate in speech, but who struggle to write a paragraph (younger students) or a paper (older students). 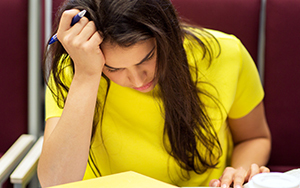 Problems with identifying main ideas interfere with test-taking. A student may miss the point of an open-ended question. I’ve seen “D’s” on essay questions when students in fact knew everything about the subject, just not what to include in that particular answer. These difficulties can be misinterpreted, particularly in students whose behavior is viewed as difficult. Refusal to write, minimally elaborated papers, and avoidance of reading fiction and poetry are chalked up to oppositional behavior or lack of motivation. Inconsistent test results are viewed as proof that “they can do it when they try.” Actually, how tests are administered can be critical: most standardized reading tests are multiple-choice. Specific remediation of skills and helping students discover their own strategies for these language challenges can unlock untapped capabilities. One especially articulate and brilliant girl I evaluated had talked her way out of every paper through high school, and got into college only to drop out when the first paper was assigned. She had no idea how to prioritize main ideas and supporting evidence in order to organize her writing. Tutors who said, “Just make an outline,” were totally useless. She was on her fourth college when I met her. Once her challenge was understood and she got useful help, she had a wonderful, successful college career. Writing papers was never her favorite activity, but she got through them and was able to pursue the arts that were her true gift. Marcia Eckerd is an evaluator, consultant, and therapist who specializes in working with children with NLD and autism-spectrum disorders. This article originally appeared on PsychCentral.com as Asperger and NLD Students: Unmet Learning Challenges. All rights reserved. Reprinted here with permission.